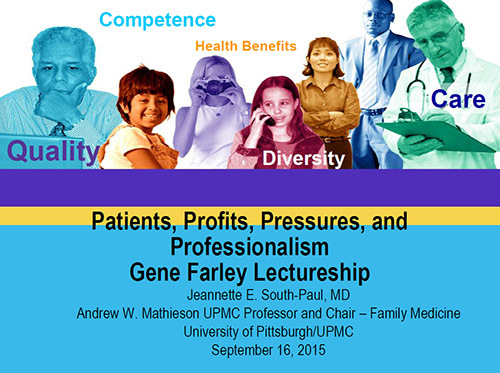 The UW Department of Family Medicine and Community Health (DFMCH) proudly welcomed Jeannette South-Paul, MD, as its 2015 Eugene Farley Visiting Professor on September 16, 2015. Dr. South-Paul’s presentation at the Farley/Frey reception, “Patients, Profits, Pressures, and Professionalism,” focused on the importance—and challenges—of providing culturally competent patient- and family-centered care in today’s health care environment. She shared two case studies of patients for whom cultural factors played a significant role in the quality of health care they received. Health care comprises overlapping cultures, she explained: the culture of the people and communities being served, the culture of providers, and the culture of the health care organization. Dr. South-Paul emphasized that individual cultural humility is a prerequisite to cultural competence. But providing truly culturally competent health care also requires deeper efforts at the institutional and community levels. She acknowledged the pressures that physicians face today: patient complexity and socioeconomic vulnerability, a changing provider workforce and decision making by non-clinicians. Success requires interdisciplinary collaboration, community monitoring and engagement, the ability to negotiate and compromise—and the will to stand firm when needed. ​Jeannette E. South-Paul, MD, is Andrew W. Mathieson professor and chair of the department of family medicine at the University of Pittsburgh School of Medicine, and the medical director of the community health services division of the University of Pittsburgh Medical Center. She is the first woman and the first African American to serve as the permanent chair of a department at the School of Medicine; and one of a small number of African-American chairs in medical schools nationwide. Dr. South-Paul is a widely recognized speaker and author on cultural competence in medical education; the impact of race, ethnicity and culture on health; cultural diversity and academic medicine; and the development of minority faculty. 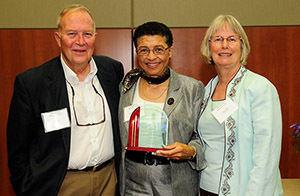 She was a colonel in the United States Army medical corps, retiring after 22 years active duty; a former chair of the northeast region minority affairs section of the Association of American Medical Colleges; a diplomate of the American Board of Family Medicine; a fellow of the American Academy of Physicians; and was elected to the Institute of Medicine in 2011. View all of this year’s submissions. The Frey Writing Awards were established in 2010 to honor John Frey, III, MD, past chair of the DFMCH, and to recognize and encourage individual creative writing.